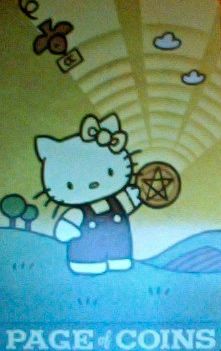 The Daily Draw: 8/16/12—Saying "Hello Kitty"
Today's Draw: Page of Coins from the Hello Kitty Tarot by Brittany Tingey. Are you waiting for word on money or health matters? Is it time to nurture something new on the home front? Or would you rather just escape practical matters altogether right now? Just when you thought you could bet money on my anti-cat, anti-cute predilection when it comes to tarot decks, along comes the super-duper cute-tastic Hello Kitty deck that I couldn't wait to get my hands on. Honestly, I don't even know what Hello Kitty is. A TV show? I don't know. But I know that when I first saw Hello Kitty in a Target ad a few years back, I was smitten. Something in my reptilian adolescent brain secreted some sort of happy chemical and I knew, one day, the perfect Hello Kitty product would fall into my hands. Oh, I can hear all the serious tarotists squirming in their seats right now just dying to say, "but that's not the REAL Hello Kitty deck. It's not the original or even a reasonable knock off of the original!" And that's ok. This is the Hello Kitty deck I want. It was drawn by an art student in Utah who clearly knew what she was doing—it comes complete with curved corners and no borders...so desired, yet so rarely furnished in the tarot world. Beyond that, it's just. So. Darned. Cute. So, anyway, I think today's kitty is for me. A little bird is bringing her a message about money and home matters. And she's holding up her coin in such a way that it radiates out into the universe, telling all the puffy clouds and lollypop trees that she's open to receive. And money messages and open to receiving is all part of my makeup this month. Everything is green and sunshiny, so I think she's going to get what she wants. The Page of Coins may also be telling us that it's time to nurture something new in the area of health and family...or that there will messages on the way regarding health and family. Or she could just be telling you to get out into nature. There's really no part of her message that doesn't apply to me today. What about you? Sometimes these cards come up just to remind you of areas you need to pay attention to in your life. Since I'm low on wisdom today, I don't have much more to tell you. Except that sometimes it's good to cross the line of cute you once drew in the sand...or any other line you've drawn in the sand. After all, the benefit of drawing lines in sand is that they're easy to erase and re-draw. And sometimes it's also good to just indulge that little girl or boy inside you—especially when it gives you a break from being an adult who weighs heavily on issues of money, health, family and the other practical matters held so lightly and innocently in Hello Kitty's hand.